Halloween and baseball have wrecked our regular coverage, so why don’t you watch The Blacklist? Here’s what’s up in the world of TV for Monday, October 28. All times are Eastern. The Blacklist (NBC, 10 p.m.): Game 5 of the World Series and the impending specter of Halloween mean that most of our regular coverage is taking a break this week. If you don’t have an awesome Halloween-themed party to go, it’s a slow night for television. So why not catch up James Spader and his shenanigans over at NBC? 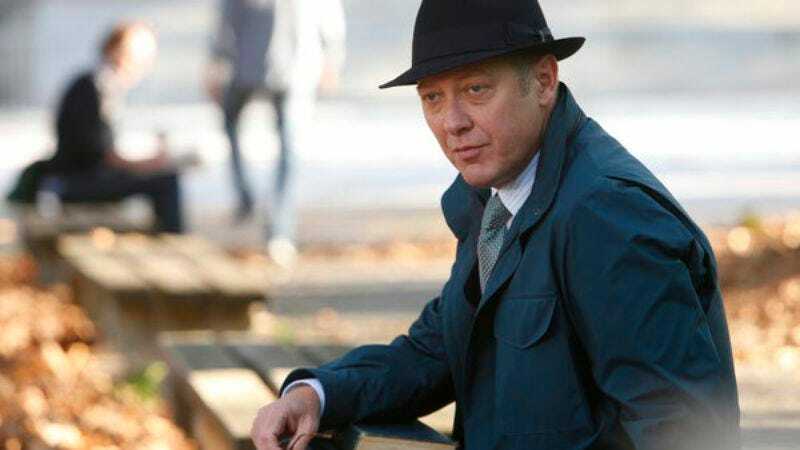 Spader’s super-villain Red is tracking a “beautiful yet menacing corporate terrorist,” while Tom confronts Liz about a “mysterious box.” This is going to be a doozy of an episode, we can tell already. Phil Dyess-Nugent is beautiful and menacing on Monday evenings, but Monday evenings only. How I Met Your Mother (CBS, 8 p.m.): Marshall is trying to get the entire group to delete an incriminating text message on his beloved wife Lily’s phone. True love is manipulation over the Internet. At least, that’s what Donna Bowman has always thought. Mom (CBS, 9:30 p.m.): Christy is trying to practice abstinence with her new beau, played by Justin Long. And as it turns out, Bonnie has an Alcoholics Anonymous nemesis. Her name is Marjorie. How fun! Todd VanDerWerff wants a nemesis! Hostages (CBS, 10 p.m.): Ellen’s sister drops by for an unexpected visit, so the Saunderses and Duncan Carlisle have to pretend like their insane kidnapped hostage-state is normal. Then the secret service begins to question Ellen, and she has to pretend everything’s fine with them, too! Which leads Sonia Saraiya to wonder if maybe everything is okay, and Duncan is just going to move in and make duct-tape sculptures in the basement. The Voice (NBC, 8 p.m.): The knockouts round of the competitions has begun. Two judges pit their contestants against each other. To the death! No, not to the death. But we think every reality show sounds more interesting with “to the death” thrown in there somewhere. 2 Broke Girls (CBS, 8:30 p.m.): Caroline throws out some old bedsheets of Max’s without realizing that Max was sentimentally attached to those sheets. We can’t wait to find out what that creepy story is. Scare Tactics (SyFy, marathon): Unsuspecting regular people are tricked into being terrified by horror-movie clichés. This hidden-camera comedy show is airing episodes of hilarious pranks all day, including four new episodes. The Real Housewives Of Atlanta (Bravo, 10 p.m.): Lea and Adriana are feuding, and Lisa tries to mend it. She doesn’t succeed. Meanwhile she’s dealing with Joanna taking out her wedding issues on her, too. Poor Lisa! Castle (CBS, 10 p.m.): A murderer kills a woman and poses her body into something that looks like the product of a terrifying ritual. Speaking of terrifying rituals, Castle gets upset when his daughter starts acting like an independent adult. Blade (Encore, 8 p.m.): Wesley Snipes plays an urban vampire slayer in the the gory superhero classic. So we’ve reached the point in time where films made in 1998 are considered classics. Sister Act (WE, 8 p.m.): Whoopi Goldberg plays a nightclub singer who goes into witness protection at a convent. High jinks, and soul versions of hymns, ensue. So does the warming of your heart, unless you are a terrible person. World Series, Game 5: Boston at St. Louis (Fox, 7:30 p.m.): Indeed, as far as we can tell, this is still happening. The series is tied 2-2. The Good Wife (Sunday): This show is on fire right now, making two As in a row in the middle of its fifth season. How many shows are this powerful this late in the game? Check out David Sims' review of last night's "Hitting The Fan," in which Will finds out that Alicia's leaving the firm.